The F-16 Fighting Falcon is a compact, multirole fighter aircraft. It is highly maneuverable and has proven itself in Air-to-air combat and Air-to-surface attack. It provides a relatively low cost, high performance weapon system for the US Air Force and over 20 different Allied nations. The F-16 has flown in combat missions in support of Operation Desert Storm, Northern Watch, Southern Watch, Deliberate Force, Allied Force, Noble Eagle, Enduring Freedom, and Iraqi Freedom. The F-16A, a single seat model, first flew in December 1976. The first operational F-16 was delivered to the 388th Tactical Fighter Wing at Hill AFB, Utah on January 1979. Over 2,231 F-16s were produced for the US Air Force. The F-16 is unique because of such innovations as its fly-by-wire flight controls, reclined seat backs, transparent Heads-up Display (HUD) panels to facilitate high G maneuvering, and the use of high profile, one piece canopies to give pilots greater visibility. This F-16A S/N 80-0573 was manufactured by General Dynamics and gained by the Air Force on 8 May 1982. And it was assigned to the Armament Development Center (AF Systems Command), Eglin AFB, FL in May 1982. Its last assignment was to the 3246th Test Wing (AFSC), Eglin AFB, FL on September 1989. This aircraft is painted in the 46th Test Wing color scheme stationed here at Eglin AFB, FL. 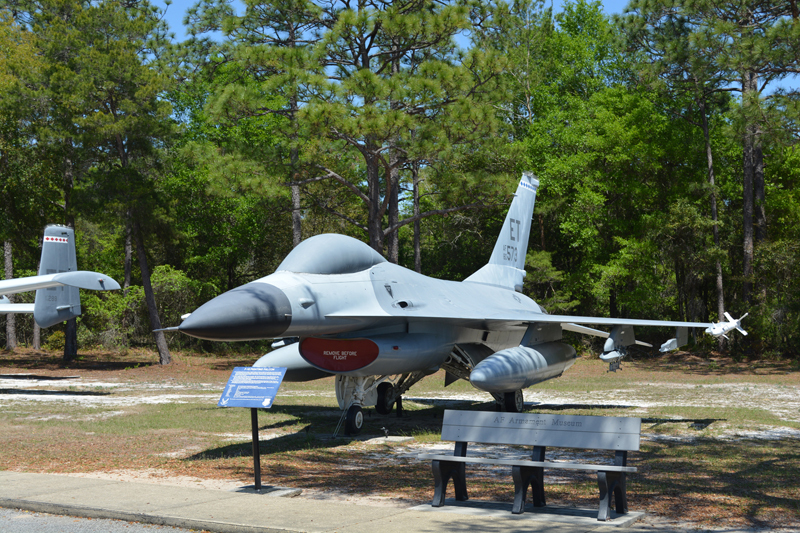 The Air Force Armament Museum is the only museum in the world dedicated to the collection, preservation and exhibition of artifacts and memorabilia associated with Air Force Armament and its platforms of delivery.